In this episode of Inbound Sales Journey, Gray and Ryan break down their four step process to upselling clients. Upselling is an important part of an agency business model. It means more value for you and the client. It's also easier and cheaper than new business since there is already a relationship and results. You're also more aware of the client's exact needs. Go through your customer database. Sort by type of services they have and see what marketing pieces they may need. Usually, you'll want to start with legacy clients. These relationships aren't usually as profitable since they're from early on in the agency. Whether it's hosting or building them a website years ago, they're a good target for you to approach with an upsell. Now move onto your other clients who have been with you for over 3-6 months. Have you just done a website for them, and now they need a plan to generate leads? Are you managing PPC for them, but they haven't been creating any new content? Are you managing their social, but their website was built in the early 2000's? You want these to be happy clients with good results. Once you've identified these opportunities, figure out what service you can offer them. Dig into their original business goal and see what else you can do to help them reach it. Do the work to find out what they need, and don't just upsell for quick money. Building a list of qualified opportunities is the first step to upselling clients. Case studies for services that you offer are a great way to show current customers what they could be missing out on. Offer what could be useful and complement their ongoing efforts. This is especially valuable if they're within the same niche. Demonstrate how other customers have found success as a result of these other services. It's an easy conversation starter and valuable for the client. "We were doing "X" (same service) for our other customer, and we started doing "Y" with them, and this was the result, and this is why it will benefit you as well." It's not an aggressive sales approach, but overcomes the fear of risk of uncertainty with results and builds credibility. They can find themselves picturing that success and have social proof. Most agencies have regular meetings scheduled with clients to discuss results. When preparing for an upsell, let them know before the meeting you have been brainstorming opportunities and would like to discuss them. Notifying the client prepares them for a presentation of some kind but it establishes that it's about better results. The most appropriate person for this discussion is the account manager and sales person if they're maintaining the relationship. Before the discussion, outline a clear path to success for the client. Have an understanding of costs, results, and timeframe. Don't be sloppy. Have a strategy to take them to the next level with your services. Then you will be able to give them a valuable and comprehensive presentation for an upsell. Once you've finished presenting, go for the ask. You've hopefully got them picturing the benefits of the other services, so it's the perfect time to ask for the business. Don't sit around hoping they get back to you about it. Use your past performance with them as well. If you have gotten them "X" results, they should have more budget to increase their spend with you. The trust and relationship are there; case studies offer credibility, you've done your homework, now close the deal. Business goals you're helping them with you're not a commodity vendor, but a partner. Upselling clients into services they need builds that relationship. It shows confidence, ability, and value by guiding them into better results. You want the best for them as your client, and upselling them is an excellent way to do it. 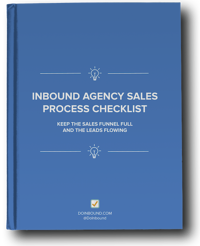 Agency owners, especially in inbound marketing, sometimes have a hard time selling. You need to realize how valuable it is what you're doing. Upselling isn't just about increasing revenue, but being a trusted partner of the business leading them to greater success. Transforming your mindset about sales to seeing it as the right thing to do will help you enjoy selling a lot more. Don't focus on how many blog posts or social media posts you offer, but about actual business value and goals. You're solving problems for the client. You're uncovering opportunities to increase their results. There's nothing selfish about selling the right way. Obviously, if they don't need it or you can't do it, don't sell it. But always be willing to suggest others who can deliver on what would make the client better. Position yourself as a valued and indispensable partner, not just another vendor. When you are wondering or unsure about how to easily grow your business and increase revenue; remember the answer is to upsell!